While millions of viewers watched the Superbowl on February 5, nearly 150 people crammed onto the Eureka, a historic ferryboat docked at the Hyde Street Pier, for instead — a lesson in history. Chinese Whispers, a community storytelling project founded by City College Interdisciplinary Studies professor Rene Yung, presented a multimedia workshop reading aimed at spotlighting the oral histories of Chinese immigrants who settled in the Bay Area during the early American West. 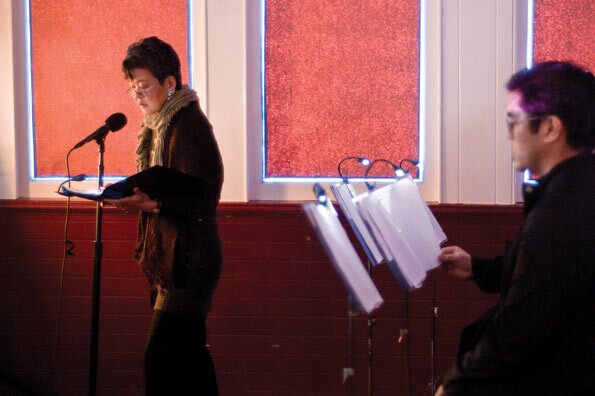 Serving as the anchor show for the organization’s San Francisco production, Chinese Whispers: Golden Gate, the event shed light on an often forgotten community. Between 1865 and 1869 alone, an estimated 15 to 20 thousand Chinese immigrants helped build the Transcontinental Railroad which ended its route on the eastern shore of the San Francisco Bay. Inside the Eureka’s damp interior, eight storytellers sat in front of the crowd. Some readers shared their own accounts while others acted as proxies for other community members. They performed over a soundscape that featured imagined sounds from the highlighted time period — audio of cooking, talking and Chinatown shops. A colorful variety of folk memories were artfully revealed. A young boy eats aquatic snails in black bean sauce with his grandfather. The Chinese Exclusion Act prohibits Chinese immigrants from becoming American citizens preventing husbands from sending for their wives in China. An amateur photographer sleeps with a wooden block for a pillow in a small room in Chinatown and China Camp residents remember when 5,000 pounds of shrimp were caught a day. The event’s anecdotal material was drawn directly from the dozens of community member interviews that Yung conducted in the Bay Area during 2011. She safeguarded the authenticity of the collected stories by using the original words of each interviewee. The stories were only shared by interviewees themselves or other community members. “I knew I wanted actual people from the community to be the storytellers — not actors. It’s a form of investing power back in the community. They are stewards of their own stories,” Yung said. Eighty-year-old Ford Lee was the oldest storyteller to perform. He stressed the value of preserving Chinese oral history. Chinese Whispers, named after a children’s game known as “Telephone” in Anglo-American culture, was founded in 2006 after Yung was commissioned to do an installation art piece in Idaho highlighting 19th century Chinese railroad and mine workers. Yung, a native of Hong Kong, admits she initially knew nothing about the subject. After finding very little information about Chinese migrants in official history sources, she began talking to people. After returning from Idaho, Yung founded Chinese Whispers to recapture the oral history of Chinese immigrant workers who helped build the Transcontinental Railroad, developed settlements and worked in mines during the 1800s. The organization’s first event, Chinese Whispers: Sierra Stories, was presented in 2009 as a pilot production featuring stories from the Sierra Nevada Foothills. Yung intends to conduct more interviews to supplement Chinese Whispers: Golden Gate. In addition, Chinese Whispers is developing an online mapping project called Chinese Whispers: Mapping the Traces which will visually represent identifiable patterns and levels of data extracted from the oral histories being collected.